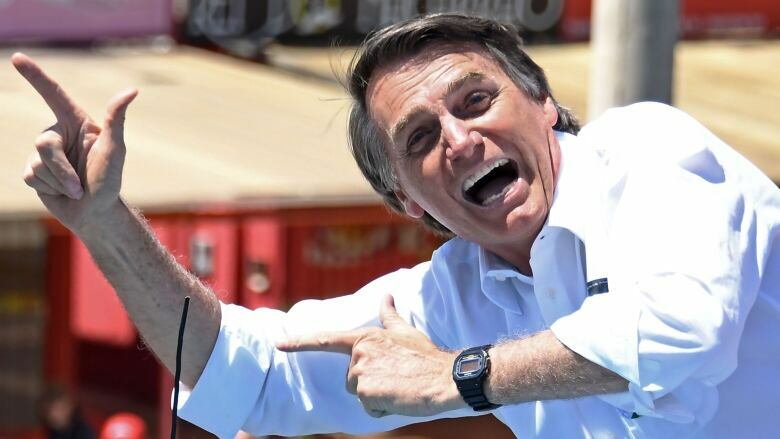 Could Brazil be about to elect 'the Tropical Trump'? 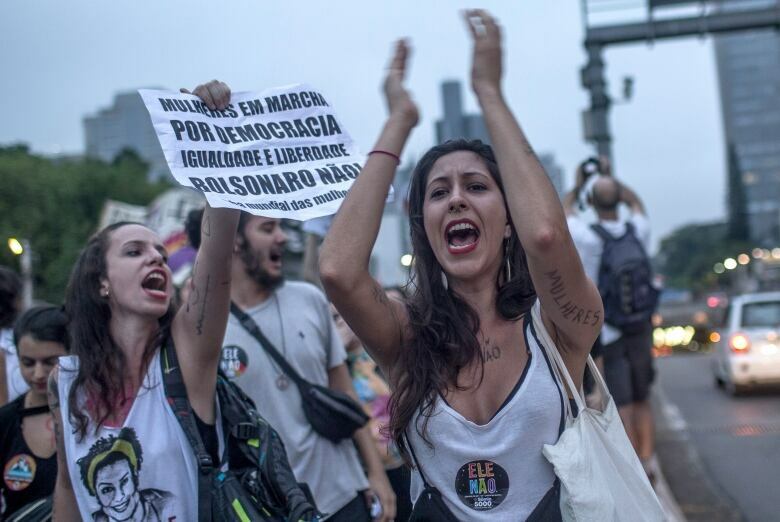 As Brazilians head to the polls Sunday, a dramatic election campaign — where one candidate is in prison, and another was stabbed — could deliver a watershed moment in the country's history. Dubbed the 'Tropical Trump,' Jair Bolsonaro is leading the race to become Brazil's next president, by promising citizens that he will crack down on the country's soaring crime rate. "People are afraid all the time," said Stephanie Nolen, Brazil-based Latin America correspondent for the Globe and Mail. "And so when you're afraid, I think a message like this — even if it's not very logical — is quite appealing," she told The Current's guest host Piya Chattopadhyay. Until last month, Bolsonaro was polling a distant second to former president Luiz Inácio "Lula" da Silva, despite the fact that da Silva is currently in prison serving a 12-year sentence for corruption. On Sept. 6, Bolsonaro was stabbed on the campaign trail and hospitalized — from where he continued his election efforts. The following week, da Silva was barred from running by the country's top electoral tribunal. He has been replaced on the ballot by his running mate Fernando Haddad. 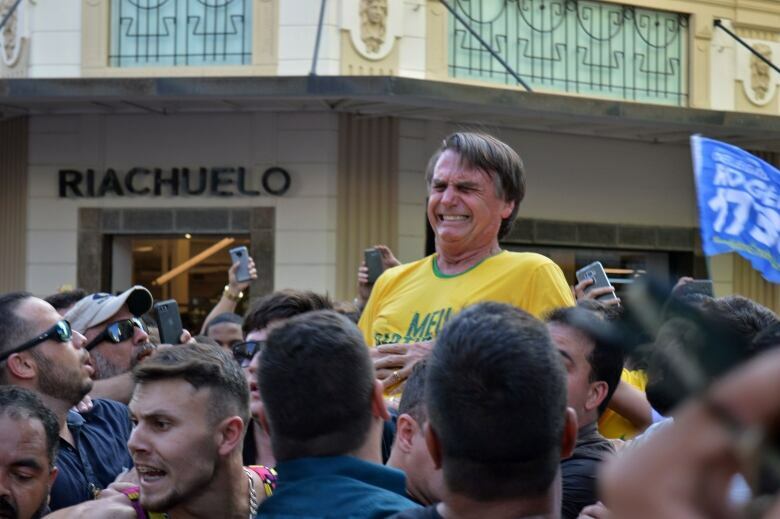 Bolsonaro is now the favourite to win when polls open Sunday, despite pronouncements on women and the LGBT community that have sparked protests, and prompted the comparisons to U.S. President Donald Trump. Nolen doesn't think the comparison really helps people understand the specific circumstances of his rise in Brazil. "He's been very effective in drawing political support … from people who don't actually, necessarily agree," she said. She sees a similarity in Trump supporters who say: "Oh, I don't like a lot of what he says, but he speaks his mind and he's honest and so he's different from all those other people, because he tells me what he really thinks." "Even if what he really thinks is kind of abhorrent," she said, "a lot of Brazilians seem to feel like: 'Oh, at last, here is a political figure who tells the truth.'" Joanna Burigo, is the founder of Casa da Mae Joanna, a feminist consulting firm, educating organizations and businesses on gender. Oswaldo Junqueira Franco, a Bolsonaro supporter and an economist who runs his own farming-related consulting firm. Produced by The Current's Kristian Jebsen and Samira Mohyeddin.